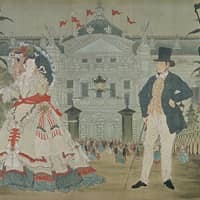 The eponymous exhibition commemorating the 130th year since the death of Kawanabe Kyosai (1831-89) at the Hyogo Prefectural Museum of Art is the latest in a crescendo of Kyosai exhibitions. 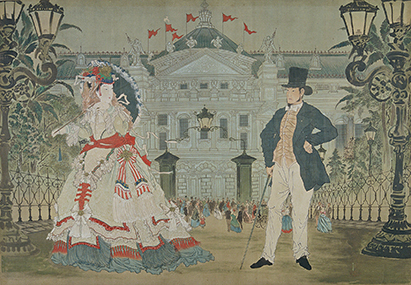 The 200-odd works on show celebrate the eccentric painter and printmaker’s pictorial diversity produced within 19th-century Japan’s social restructuring and modernizing tumult. The crests and troughs of Kyosai’s reputation are almost alarming. An overachieving infant, he sketched at age 3, studied ukiyo-e with Utagawa Kuniyoshi (1798-1861) from 7 and joined the Surugadai branch of the late-traditional Kano school of painting at age 10. Ukiyo-e and Kano practices did not usually go hand in hand. The former was often used by Kyosai for coruscating satire. “Repelling of the Mongol Pirate Ships” (1863), for example, depicts the Mongol invasions of the Kamakura Period (1185-1333), while alluding to a contemporary attack by Choshu clan forces on an American merchant ship anchored in the Shimonoseki Straits. Kano school painting, on the other hand, was frequently used for old-world propriety, as in the religious icon in Kyosai’s earliest extant painting, “Bishamonten (Vaisravana)” (1848), and that suggested in his much less common landscape paintings like “Immortals Amid Sacred Mountains” (1861-92). In 1870, while drunk at a party, Kyosai offended Japanese authorities so much with a caricature of fawningly obedient government officials that he was imprisoned in a guardhouse and then lashed 50 times. Shunned as an ex-convict, he fell out of official favor until 1881, when his painting, “Winter Crow on a Withered Branch” was awarded the top prize at Japan’s second National Industrial Exhibition. The judging committee called Kyosai’s crow, depicted perched on a branch, “close to godly.” Though that original painting is not in this exhibition, related and similarly themed ones are on display. Ascendant again, Kyosai attracted the Japan-based, culturally inquisitive foreigners of his time, and his reputation soared. The British architect Josiah Conder (1852-1920), the Irish journalist Francis Brinkley (1841-1912) and American painter, John La Farge (1835-1910), invariably called Kyosai either the best living Japanese painter or the greatest Japanese artist after Hokusai. Mortimer Menpes (1855-1938), a pupil of James McNeill Whistler, estimated him as “one of the greatest painters of the day.” Within his own lifetime, Kyosai even had collectors overseas, apparently leading to him becoming the first Japanese with an obituary printed abroad, in Le Figaro. After World War II, however, he became increasingly forgotten, and rekindling interest in his work became the mantle of his great granddaughter, Kusumi Kawanabe. Kusumi established a memorial museum in 1977, initially in a corner of her home. Now that collection furnishes the current exhibition with the better part of works on show. International recognition was subsequently reclaimed in the 1993-94 “Demon of Painting Art of Kawanabe Kyosai” exhibition at the British Museum in London. Locally, the Kyoto National Museum held a blockbuster Kyosai show in 2008. And more recently, “Kyosai: Master Painter and his Student Josiah Conder” was at the Mitsubishi Ichigokan Museum, Tokyo in 2015, while “This is Kyosai! : The Israel Goldman Collection,” toured the country in 2017. Kyosai evidently reveled in the societal and cultural self-absorptions of his times, their seriousness and foolishness, idiosyncrasies, pleasures and pains. And now he has been rehabilitated as a paragon for our times too, in a veritable Kyosai boom. “Kyosai Kawanabe” at Hyogo Prefectural Museum of Art runs until May 19; ¥1,400. For more information, visit www.artm.pref.hyogo.jp.